People. They’re the driving force behind your recruitment, retention, and graduation rates. Yet the hiring process in most institutions today is based on inadequate candidate information and might even be at risk of being challenged legally. 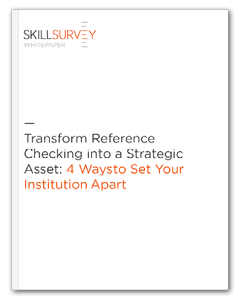 Discover how you can turn reference checking into your secret weapon in our whitepaper: Transform Reference Checking into a Strategic Asset: 4 Ways to Set Your Institution Apart.